Gothic fiction's prominent elements are commonly listed as: psychological and physical terror, mystery, the supernatural, ghosts, haunted spaces and Gothic architecture, death, decay, doubles, madness, secrets, hereditary curses. Stoker has it all. Gothic romance also has, and for some reason this feature does not appear in the lists, repressed female sexuality, a predominant element, if not of all Gothic literature, certainly of Gothic tales told by men, full of heaving bodices representing libido. Stoker is the first English-language film from Korean director Park Chan-wook, best known in the U.S. for Oldboy (which I just re-watched in anticipation of Spike Lee's remake scheduled for release late this year), the second film in his vengeance trilogy. Park earned a degree in philosophy before working in film, and it shows in his work. Park's characters are ordinary people who find themselves in situations that drive them to extremes of violence. The violence could seem gratuitous to the casual viewer, but an undertone of something more pulses in his stories, epistemological questions about the nature of knowledge and understanding, metaphysical forays into the nature of reality, and in the case of Oldboy, questions posed by normative ethics. Stoker opens on India Stoker (Mia Wasikowka). It's her birthday at the threshold of womanhood. Her father has just been killed in a car accident. At the funeral his brother, Charlie (Matthew Goode) -- a mysterious stranger of whom she is entirely unaware -- announces that he will be staying with India and her fragile -- and seductive -- mother Eve (Nicole Kidman). Charlie professes to be a world traveler. He also has a disturbingly sinister charisma and a manipulative disposition. The housekeeper disappears; a concerned relative shows up; the Hitchockian suspense builds. The neo-Gothic Stoker mixes horror and romance with Park's hallmark aesthetic elegance on the one hand and brutal violence on the other. Not for the faint of heart. Imogene (Kristen Wiig) lives blithely among the affluent on the Upper East Side where she attends fund raisers and does lunch. When her boyfriend dumps her, things go from bad to worse until a court order puts her into the custody of her benighted New Jersey mother Zelda (Annette Bening). New Jersey is the last place an aspiring socialite like Imogene wants to be, especially since the household also shelters her weirdo brother Ralph (Christopher Fitzgerald), a roomer (Darren Criss), and Zelda's beefcake lover who claims to be a secret agent for the CIA. Directed by Shari Springer Berman and Robert PulciniIt, Girl Most Likely lays out a predictable setup. A plot about a girl who wants to put her past behind her goes through a few implausible twists in order for her to find that home is where the heart is. I have great admiration for Woody Allen as a filmmaker. I remember when Interiors came out in 1978. People were outraged and felt betrayed because the film was not a comedy -- much as Bob Dylan's audiences booed when he went electric. I like Allen's darker side -- September, Another Woman, Crimes and Misdemeaners, which is one of my all-time Woody favorites, and Shadows and Fog, which I thought fell short. I did not like Match Point, To Rome with Love and Vicky Christina Barcelona, which everyone else loved, and I really liked Whatever Works, which everyone else hated. I consider Radio Days and Zelig brilliant. He does so much, tries everything, and though his neuroses are his hallmark, to look at his oeuvre one would be hard pressed to believe that he fears failure. So some of the films are better than others. I was prepared to dislike Blue Jasmine, but I liked it. I had read that the title character is a female version of the Woody Allen character, but I don't agree with that (rather shallow) assessment. The plot is old, but Cate Blanchett's performance is off the charts. Everybody is good -- Sally Hawkins, Bobby Cannavale, Andrew Dice Clay -- even Alec Baldwin isn't bad. But Blanchett -- just when I am certain I have not a shred of sympathy for her self-centered character, Blanchett manages to give her humanity. In a World... is written and directed by and stars Lake Bell as Carol, a woman trying to break into the decidedly male world of voice-over. I remember as a girl, both my parents, not just my father, telling me that women simply could not do television news because their voices are too shrill. This is nothing against women, mind you. It's just that women's voices are unpleasant. At 30 Carol still lives in her father's house. Sam (Fred Melamed) is not just her father but one of the giants of the voice-over world. He loves his daughter, but refuses to encourage her because 1) he's too self-absorbed and 2) he's a sexist of a certain age. To make matters worse, Sam is not Carol's only detractor in a subculture of underhanded rivalries and over-sized egos where up and coming talents vie to be taken into the fold. The casting is spot on, and Lake Bell's script steers clear of cliché, finding humanity and vulnerability even in characters who are potentially less than likable in this little world unto itself. 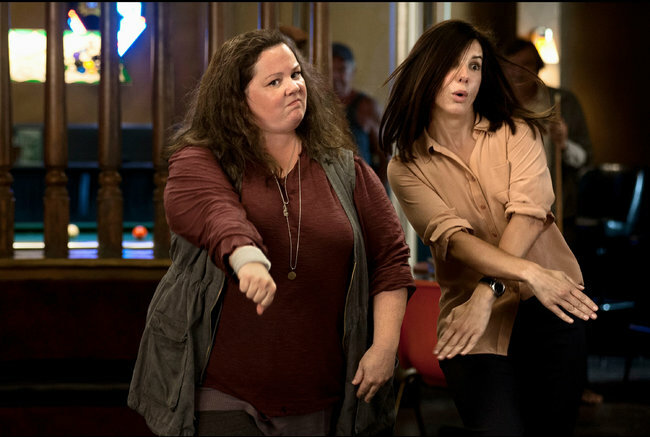 Seth Gordon's Identity Thief and The Heat, directed by Paul Feig (Bridesmaids) and co-starring Sandra Bullock, would both be really bad movies were it not for Melissa McCarthy's kinetic energy, rapid-fire improvisational delivery, and wildly self-confident physicality. The phrase "over the top" was invented for her. She is queen of the pratfall, empress of slapstick, an impish roughhousing buffoon who, without your even knowing it, is creating a multidimensional character that she springs on you unexpectedly about halfway or so through the movie. McCarthy burns with a magnetic attraction that kindles the chemistry between herself and whoever is cast opposite her.